A Hacked Gadget reader is looking for a prototype designer to build a prototype of a new game he is wanting to develop. He has built a site with some detailed information. "I invented a board/action and skill game that I am seeking to license out to a company. However, most companies will not look at my game unless I have a working model of it; hence, this ad. I am seeking an individual who can put together (create) "working" prototypes of my game's timer and remote. This person must know about certain types of electronics. The completed timer must be controllable by its own buttons or by buttons on its remote." and let me know if you want to talk more. It would be a great learning experience for many people on this site who are interested in progressing their knowledge in electronics if we could bump this and make it a sort of "site project". Basically allow everyone on the site to participate on some level. I'm a programmer at heart, so I'm sure I'm capable of figuring out the electronic side of this project with some help from the community and the Internet. However, I have limited knowledge of electronic circuits and would be much more suited working on improving the design / function and the documentation / presentation of the project and final product. I think this is the same for everyone here, our members have a lot of combined knowledge and know how to offer the project collectively. They are well versed in many different ways and I think we could all benefit from the project, especially the final product. This way whatever proceeds are derived from the effort can go towards improving our site. Are there bi-color seven segment display? I have never seen any... Not to say they don't exist though. Are two rows of buttons needed, couldn't there be just one row and a switch or button that selects between team A and team B? Makes sense to me, you should suggest that to the idea creator. It would save pins on the micro-controller and make the code a little easier. Instead of using the eight segment LED display you could use an LCD that displays multi text colors. The only problem is that the LCD would have to be large and it could be expensive for a board game setup. I have a catalog that has several LCDs that display multi text colors, closest I found was green and yellow. The LCD could be used to set up options and different game types if the designer is including these features. 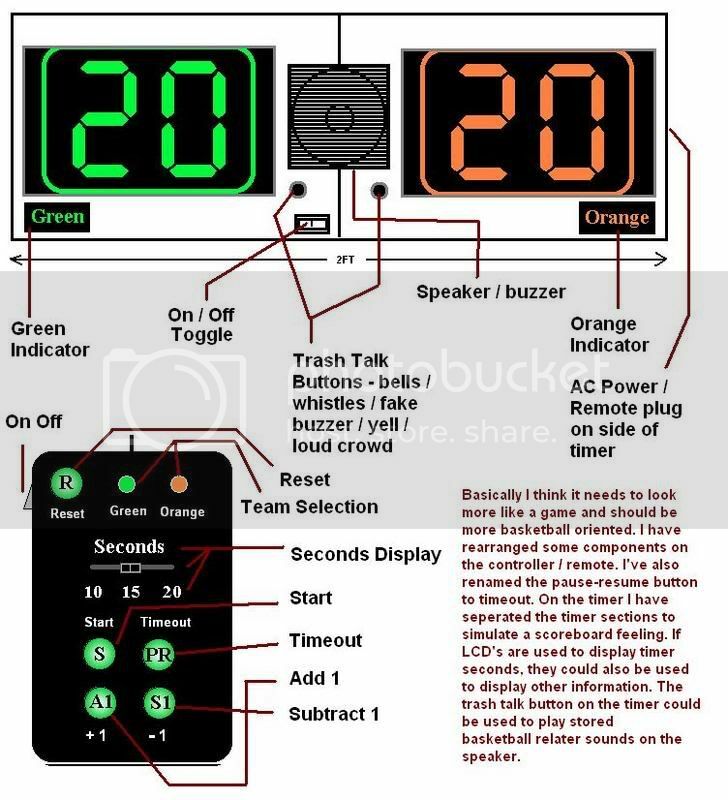 Hardware: Timer, buzzer or speaker, LCD, cases for timer and remote, several different types of switches, ac power cord, pic(s) to control hardware, coded program for the game, wireless reciever and sender for remote / timer, all kinds of wiring and interfacing. The bulk of the hardware, IE the chip and the lcd should be placed in the timer. The timer should also be bigger so it can be seen from a distance clearly. I'm thinking this will be some sort of set timer - then make as many shots as you can in the time kinda game. It may have additional trivia or rules associated. Using stock components would cut the cost of production greatly. Here's some ideas I was having when reviewing the design of the game. I've added a few features and rearranged the placement of some of the buttons on the remote. I've also changed the design of the timer to include two seaperate timers and a speaker in the center. This could be mounted to a basketball pole or attached to a wall with suction cups. I'm not sure how this game is supposed to work, if you get a point do you get to add a second? If thats the case then a censor on the basketball hoop would be useful. Those are some good ideas, I like the idea of a LCD display. It would be much more versatile. The backlight could be what makes it different colors.